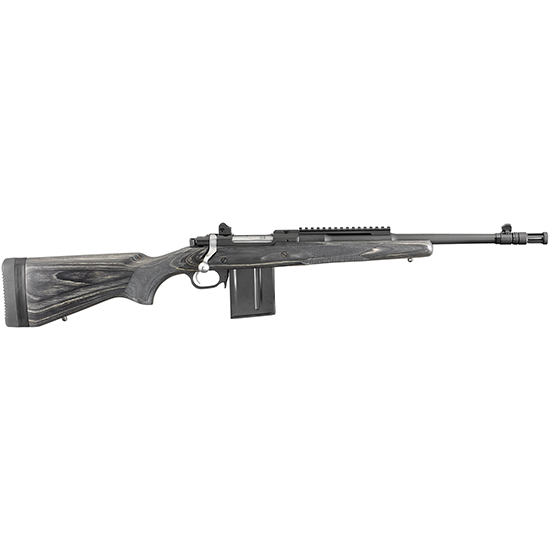 Ruger 6824 Gunsite Scout Bolt 223 Remington|5.56 NATO 16.1 10+1 Laminate Black Stk Black in. Rugers Gunsite Scout Rifle is developed with Gunsite and is Gunsite Approved" and features the Gunsite name rollmarked on the receiver. It has a forwardmounted Picatinny rail which allows for the mounting of modern optics and a builtin accurate sighting system with ghost ring adjustable rear aperture sight and a nonglare blade front sight. Patented integral scope mounts are machined directly on the solidsteel receiver which provides a stable mounting surface. The nonrotating Mausertype controlled round feed extractor features a fixed bladetype ejector that positively ejects the empty cases as the bolt is moved fully rearward. The Gunsite Scout Rifle also has a freefloated cold hammerforged barrel with ultraprecise rifling threeposition safety sling swivel studs detachable box magazine with pushforward magazine release and a soft rubber buttpad with buttpad spacers. Included are scope rings and three .5" spacers.This model has a 16.1" black steel barrel black laminate stock and Gunsite engraved on the grip cap."